China Linear Auto Tool Changer CNC Router Machining Center From www.eaglecnctec.com Jinan EagleTec CNC Machinery Co., Ltd.，a professional China CNC Router Manufacturer. Auto tool changer CNC router is the perfect solution for the jobs which have to be finished by multi types of router bits. It is widely used in production of panel furniture. Application Material: Solid wood, MDF, plastic, PVC, acrylic, and other nonmetal materials. Field: Cabinet, Wood door, Wardrobe and etc. 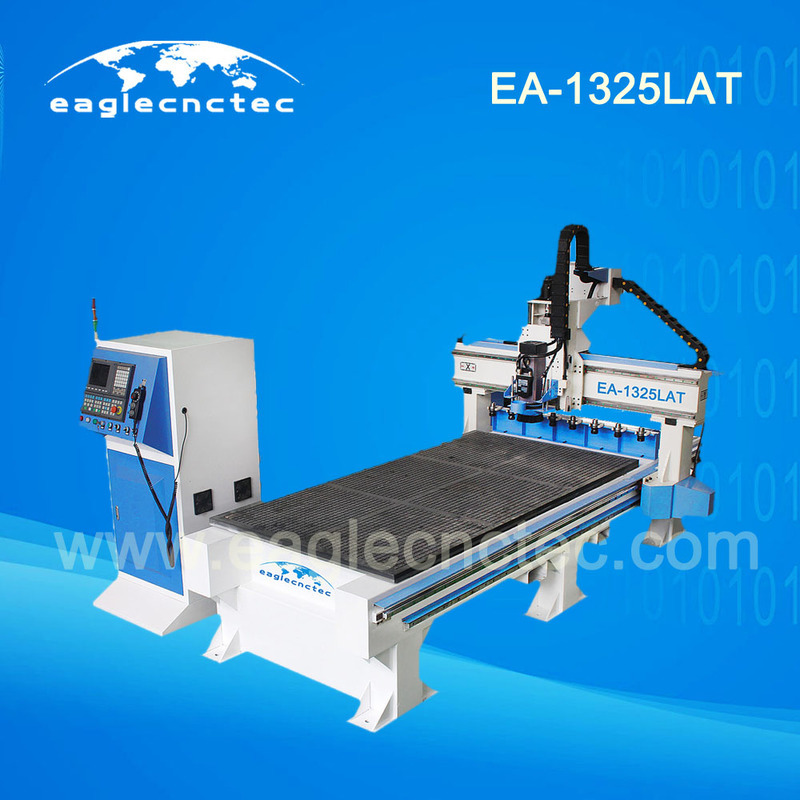 Features of cnc router machining center 1) Fast and precise with servo motors, quiet operation. This is a close loop servo driven system, which is a higher performing and zero maintenance system. Further the motors are very smooth running and give the router machine good acceleration and deceleration charactics. 2) Linear style automated tool changer with 6 tool positions in total. Another type available is pneumatic tool changer nesting machine. 3) The X and Y axis motion is via a rack and pinion drive, which is hardened for extremly long life and ground for a very good accuracy; The Z axis is driven by means of a hardened antibacklash ball-screw. 4) The Y-axis uses a dual drive, one for each side of the gantry. 5) Gantry is made of steel, unlike others who adopt aluminum materials. A steel gantry is superior to a aluminum in it’s ability to suppress and absorb the forces created during cutting. 6) The CNC router machining center is suppored by 6 legs with adjustable leveling feet. 7) All the linear guides are centrally lubricated from a central system. 8) Vacuum table with 8 vacuum zones.